Ethiopia’s economy and the well-being of its people varies, in part, with the climate. Natural climate variability and long-term climate trends both contribute to fluctuations in weather that affect operations in water resources, agriculture, energy, health and more. Periodic droughts continue to cause hunger. Rising temperatures are exposing more people to malaria. Tigray, Ethiopia. Photo: Rod Waddington. License: CC BY-SA 2.0. But our ability to monitor and predict climate also provides an opportunity to anticipate and manage such risks. 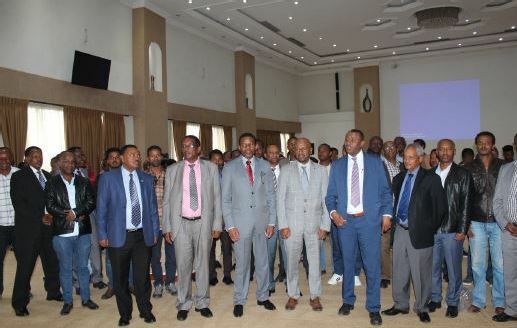 A recent workshop in Addis Ababa brought together experts from government and academic institutions to discuss how to improve the development and delivery of climate services in the country. Representatives from IRI and the World Meteorological Organization’s Global Framework for Climate Services (GFCS) also attended. The workshop was an initial step in creating a National Framework for Climate Services (NFCS), as outlined in this post from GFCS. An NFCS is a coordinating mechanism for climate services, aimed to improve risk management by incorporating science-based climate information into decision and policy making. In this respect, GFCS and IRI play complementary roles in enhancing climate services in Ethiopia. GFCS is instrumental as a platform convening stakeholders and providing system-level advisory services. The WMO Step-by-step Guidelines for Establishing a National Framework for Climate Services (WMO-No. 1206, 2018) supports NFCS governance. IRI stands out in its ability to provide high-quality, decision-relevant climate data and information products at different timescales throughout the world. The IRI Climate and Society Map Room, built on the IRI Data Library, is a collection of interactive maps and figures that provide historical climate analyses, monitoring of current climate conditions, and an array of forecasts tailored to various uses for researchers and decision-makers. IRI’s Enhancing National Climate Services initiative (ENACTS) is a unique, multi-faceted initiative designed to bring climate knowledge into national decision-making by improving the availability, access, and use of climate information. Implementation of ENACTS includes developing Map Rooms with an array of application-specific information products that use quality-controlled national data combined with globally available proxies. Participants at the Consultative Workshop on National Framework on Climate Services in Ethiopia, April 2018, Addis Ababa. Photo: World Meteorological Organization. “ENACTS lays the foundation for implementation of the national frameworks by creating suitable climate data and information products and an online dissemination platform,” said Tufa Dinku, who leads ENACTS. Eight years ago, Ethiopia became the first country to implement ENACTS. Dinku said he is glad that GFCS is interested in playing a complementary role by supporting training on the use of IRI’s free, online climate information products, which the institute plans to support through its Adapting Agriculture to Climate Today, for Tomorrow (ACToday) project. In Africa, an NFCS is fully established in eight countries, and seven other countries are at different stages of putting one in place. Read the full article from GFCS here.